My special relationship with fabrics began when I was only 4-5 years old. Remnants from dad’s shop would end up as my dolls’ outfits. Before long I was in his shop sorting Cashmere fabric samples, and breathing as much fabric lint as fresh air. We were readying his samples for the new season. It was quite a procedure. First was selecting the right samples, then cutting, sorting by color and pattern, and finally assembling them into collections in a beautifully illustrated hardcover binder. Cashmere. His shop was considered for years the “the spot” for men’s and women’s clothing fabric in the heart of downtown Athens, Greece. It was the main wholesale distributor in the country and the center fo the finest Cashmere and other fabric by the yard. Though my base has now shifted from Greece to North America, my love and knowledge of fine fabrics has remained and blossomed into exciting design projects. Fabrics talk to me! There is heart and soul in every fiber and thread, and I can certainly relate to it. colors and patterns, it sports well in outwear or sweaters, or as either simple or rich wraps in Hound’s tooth, Burberry check, or fashionable Animal print patterns. Did you know that the main source of Cashmere is the Capra Hircus goat that lives in elevations of 14,000 feet and above and primarily in China, Mongolia and Tibet. Smaller populations are also in the sub-Siberia region, India, Pakistan, Iran, Australia and New Zealand. Each goat produces approximately 4-6 ounces of fiber a year taken from its soft underbelly down, which justifies the sense of scarcity and its relatively high pricing. The term Cashmere is synonymous with Pashmina, depending on where you are. Cashmere comes in different grades and ply’s and can be mixed with silk or linen. But the true pashmina is 100% wool. The purer the cashmere content, the softer and warmer and, yes–the more expensive it is. 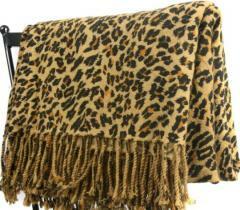 Lounge on your favorite chair wrapped up with this luxurious, soft Cashmere throw. Suƿerb internet site yοu have got there.